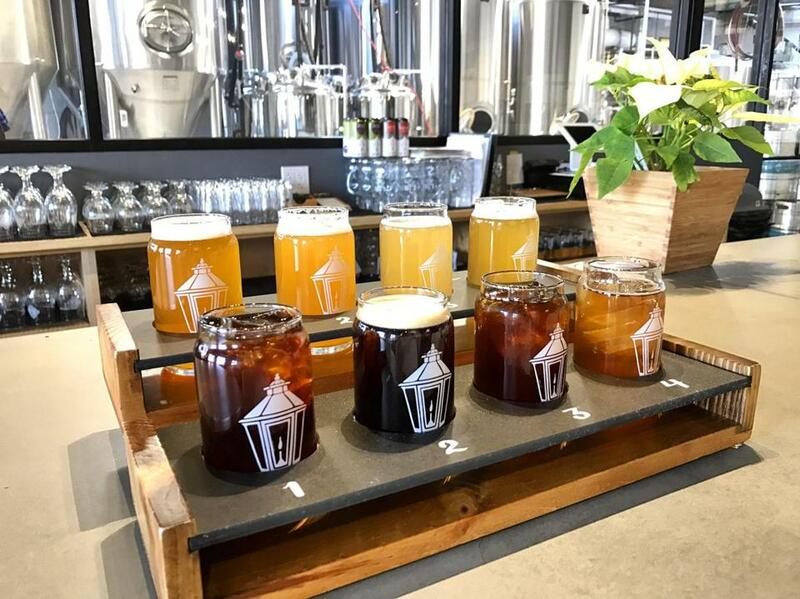 Most days, Central Square’s Lamplighter Brewing Co. opens its doors to customers at 7 a.m. and closes them around midnight. Coffee rules the mornings, as the staff from Longfellows, located on-site, plies a crowd hunched over laptops with breakfast sandwiches and nitro cold brew. You can buy a beer starting at 11 a.m., and early on a recent Sunday afternoon, a nearly equal number of folks seemed to be enjoying each beverage in a large, sunlit space framed by whitewashed brick. You can go two ways with a flight of beer at Lamplighter: The Welcome to the Jungle flight features four more-traditional brews, while the Funk It Up flight is the way to go “if you’re feeling a little bold,” says AC Jones, who cofounded Lamplighter along with Cayla Marvil in November. “I’ve got a mocha for Annie. Annie?” a barista shouts as the bartender serves up the first flight. Of the four beers here, two are standouts. Gestalt (5.9 percent ABV) is an altbier that’s nutty (think toffee covered with crushed pecans) and way more flavorful than it should be for the ABV. Lucid Nonsense (6.7 percent), the IPA, uses the El Dorado hop, so expect more melon and strawberry than grapefruit and pine. The Funk It Up Flight is more consistently rewarding. So Much for Subtlety (8.5 percent) is a double IPA with that same El Dorado hop (Jones says the hops in Lamplighter’s IPAs will keep changing due to availability), and it’s solid. More adventurous is Easy Tiger, an IPA that’s 100 percent fermented with Brettanomyces and exudes musty pineapple. It’s exciting, earthy, and exactly the kind of beer Jones likes to make. Metric Systems (5.1 percent) is a salty, refreshing gose that may be the best beer on the menu, while Astral Weeks (4.5 percent) is brewed with Brett, is aged in barrels, and drinks like a funky rosé. Lamplighter doesn’t serve food, but you can order takeout from nearby restaurants, or ask the bartender for a free bar snack, usually a Mason jar filled with Cheez-Its or pretzels. Get there early: The place fills up on weekend afternoons, and there’s a line out the door on weekend nights.